Sign Me Up-1959 chestnut. Sired by Ensign Hanover (r), out of Reba Hanover (r). Spin Me Up-1964 bay. Sired by Sign Me Up, out of The Old Maid (r). 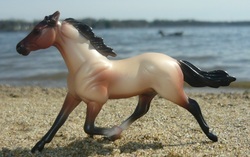 OF Breyer, Pacer, Foiled Again matte. Classy Lag-1989 gray (bay base). Sired by Laag (r), out of Classy Lady. Inbred to Silent Majority in the 3rd and 4th generations. 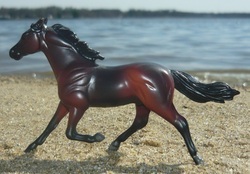 Blue Chip Cadeau-1995 black. Sired by Caesar Blue Chip (r), out of El Cadeau (r). 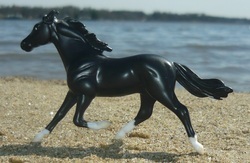 2012-Rapid Fire, dark bay colt (x ?) o/b ? Magic Show-1998 bay tobiano. Sired by Rorschach (r0, out of Majestic Mira (r). Talladega Rek-2000 black. Sired by Talladega, out of Rekall. Bred by Double Hart Ranch and bought from Michele VonHagen. First Class-2000 bay. Sired by Lobro Quest (r), out of Classy Lady. OF Grand Champion, FNN foal, First Class. Broadway Dance-2005 bay roan. Sired by Broadway Or Bust, out of Fulla Dance. Bred by Orchid Vale and bought from Michele VonHagen. Broadway Magic-2006 bay/dark bay. Sired by Broadway Or Bust, and out of Blue Chip Camelia. Bred by Orchid Vale and bought from Michele VonHagen. 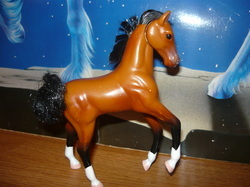 OF Breyer SM G2 STB. Imagecatcher-2007 gray (bay base). Sired by Gimage, out of Dreamcatcher. Bred by ? Copperleaf (AUS)-2015 black. Sired by Fifth Derby (AUS), out of Neferne (NZ). Bred by Gubbera Park. Imported.